Being positive and as happy as possible during your battle with cancer is essential and very often underestimated. I wish Happy Magazine was out during my own fight. It is the first Irish cancer support magazine. It is dedicated to all cancer patients and their families. Holly Kennedy, who went through cancer herself is a very young mum, journalist and editor of Happy Magazine. She puts her entire enthusiasm, energy and experience into providing inspiration for happiness to those fighting the disease. The magazine started online in July 2017 and will soon also be published as a print edition quarterly. It will be available free of charge at locations across the country. 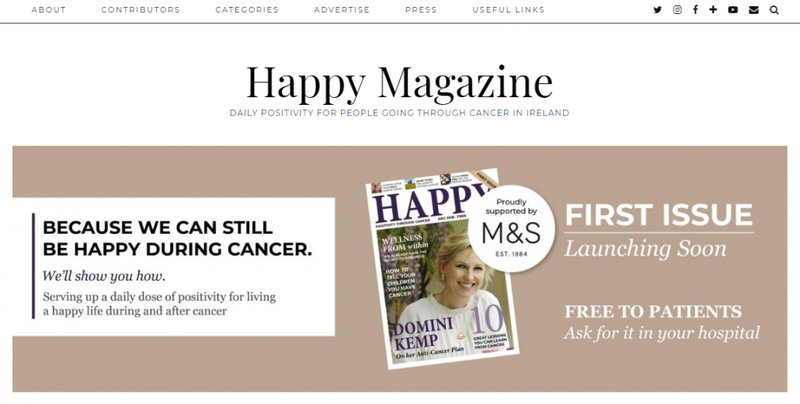 HappyMagazine.ie publishes relevant and helpful content online every day for anyone going through cancer or surviving after it. It’s full of excellent articles, advice and expertise in areas such as Health & Wellbeing, Food & Nutrition, Life Coaches, Beauty and Books. You can find other patient’s cancer stories and if you wish you can share your experience with cancer as well. Happy Magazine provides much-needed support to newly diagnosed patients. You can learn how to get ready for a hospital stay, chemotherapy, what helps during treatment, etc. The magazine will also help you find many other cancer-related resources, blogs and professional services. Reading it you won’t feel alone and lost! I can’t recommend Happy Magazine enough. It’s a place where you will find a positive inspiration for living a happy life after a cancer diagnosis.